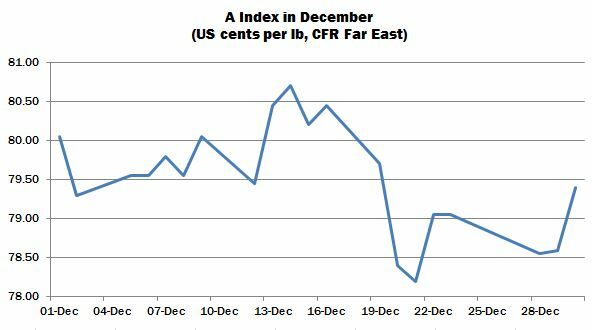 International cotton prices fluctuated within a range of a few cents during December, ending lower on balance. The Cotlook A Index started the period at roughly 80.00 US cents per lb and advanced to a high point of 80.70 cents mid-month, before declining to reach a low of 78.20 cents around one week later. The downward movement was prompted by lower settlements in New York, which registered its lowest level since mid-November. Mill buying activity was characterised by ‘on-call’ purchasing early in the period. The subsequent decline in futures was reflected in shippers’ offering rates and prompted a fairly active mill demand, mainly for nearby delivery, for a relatively wide range of growths. Business was concluded for West African, Brazilian, Central Asian and US cotton among others, with the most persistent demand emanating from the Indian Subcontinent. Pockets of forward business were in evidence throughout the month. Mill buyers in Bangladesh were enquiring actively for African Franc Zone cotton. However, some merchants became less willing to offer that origin in volume as the month progressed, owing to a perception that already firm basis levels may experience further upward pressure. Many merchants are understood already to have sold that portion of their long position available for first quarter shipment, and thus feel little or no inclination to discount their offers. In Pakistan, the unexpected cessation of Import Permits for Indian cotton that occurred in November continued to interrupt the flow of Indian supplies at customs, thereby increasing mills’ reliance on competing origins such as West African. As it transpired, Indian stocks began moving to Pakistan’s mills late in the month and despite the lack of any official announcement, Indian shippers became more willing to conclude fresh business. Seed cotton arrivals in India remained considerably behind the pace of last year, as the continuing effects of the government’s ‘demonetisation’ measures, introduced in November, restricted liquidity and lessened pressure from the supply side. Good local demand for Indian cotton coupled with the disruption to exports contributed to firm asking rates, prompting some Indian mills to turn to imports. Though import demand from India would be expected later in the harvest, when spinners may prefer outside growths on quality or price grounds, its materialisation at such an early stage was considered surprising. Overall, the firmness of Indian prices remained a supportive feature of the international market during December. 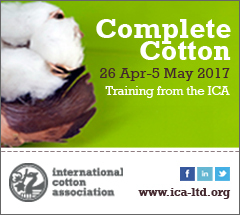 The Cotton Corporation of India announced late in the month that it will purchase domestic crop at the market rate, for the first time in four seasons (it may be recalled that in recent years the Corporation has bought only when prices have fallen below a government defined Minimum Support Price). The Corporation expressed intentions to procure up to 1.5 million local bales (170 kgs) to be sold via e-auction later in the season, in an effort to ease the stress that may be experienced by the spinning sector by any lack of availability. In the United States, export registrations continued considerably ahead of the pace of last season. Weekly commitments of upland cotton were impressive, registering a marketing-year high of over 400,000 running bales at the start of the month. By December 29, cumulative commitments (of all cotton) stood some 3.5 million running bales ahead of the same point in 2015. China and Vietnam continued to feature heavily in weekly reports (no doubt including purchases by Chinese-owned enterprises), and mills in China were thought to be buying on the assumption of an upcoming allocation of 2017 import quota. On December 9, USDA’s monthly supply and demand estimates included an increase in the export projection for the season of 200,000 bales (480 lbs), to 12.2 million. However, that adjustment was more than offset by an increase of 360,000 bales in the production forecast, reflecting higher yields than the Department had earlier anticipated, and a reduction of 200,000 in the estimate of domestic consumption. As a result, the season’s projected carryover was raised to 4.8 million bales, which implies an increase of one million bales during the course of the 2016/17 season. Given the confirmation given in November that Chinese imports will remain restricted and state reserve auctions will continue in 2017, it can be presumed that the government stockpile will be reduced by a roughly similar volume to the 2.6 million tonnes that was returned to the market in the previous year. Cotlook’s estimates of Chinese production and consumption are unchanged on the month and continue to imply a reduction to stocks of 2.16 million tonnes. In the world outside China, major changes during the month included a reduction to India’s consumption figure of one million local bales, owing to the disruption to demand that was caused by the aforementioned currency issues. This implies a not insignificant increase in the country’s exportable surplus. Washington’s lower figure for US consumption was also adopted. Moderate reductions to crops such as that of Pakistan (impacted by a slower pace of arrivals than had been anticipated) have been more than offset by upward adjustments for other origins, including a considerable rise in the US figure, as discussed above. Our Australian production forecast has also undergone a further increase, representing the biggest crop since 2012/13, with observers remarking that the outlook may rise higher as the season progresses. 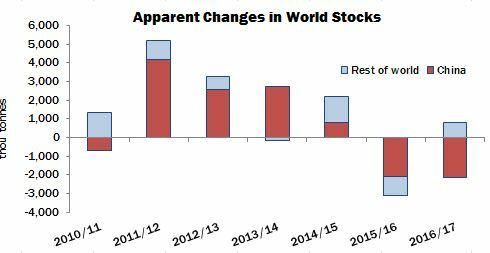 The resulting changes to world stock levels imply an addition outside China of 792,000 tonnes, some 210,000 tonnes higher than the change put forward just one month ago. The rather bearish configuration of global statistics might thus suggest a negative direction for prices in the later stages of the season, but the year ended with market sentiment on a relatively firm note.